UPDATE: The flyaway (from Everett) should occur on the 4th for 805A and 807A which means delivery (formal paper signing and transfer of money) should occur by the 3rd of January. Just got a message as well as saw a posting on an airliners.net forum that all three 787s that were due to be delivered around now have "gone tech" meaning there is a maintenance related issue with all three airplanes. JA805A (L/N 31, ZA116) was supposed to depart Everett 2 days ago and is now schedule to be flown out on Jan. 4th in an evening depature. JA807A (L/N 41, ZA104) will fly out the same day a little later after JA805A has left(it was to deliver on Dec. 30th and fly out a couple days later). JA804A's (L/N 9, ZA102) delivery was also scheduled for Dec. 30th (fly out a couple days later) but also cancelled though for unknown reasons. It is not known when it will be ready for delivery though this aircraft has flown as recently as Dec. 30th (as had ZA104). Currently there are no other 78 deliveries scheduled in January but this doesn't mean that Boeing will not deliver any more beyond the two aforementioned aircraft. The situation is very fluid and it is unknown if the issues affecting these two aircraft is something more endemic throughout all the 787s or if this a one off situation. Today is December 31st, 2011 and there has been no further evidence of any other 787 deliveries beyond the ones made in September and October. This doesn't indicate that ANA and Boeing has concluded the formal signing over of the aircraft and transferring of money and signing of documents. That may well have happened already but no aircraft has left Everett bound for Japan as of yet and there has been no announcement from Boeing or ANA of the formal delivery of any of these airplanes. ZA116 (JA805A) is still in Everett and has flown both Boeing and customer flights but I don't know if there are more test flights that have yet to be done or if there is any more work that needs to be concluded on the airplane itself. This Dreamliner is probably the one that is closest to being delivered. The other two airplanes ZA104 (JA807A) and ZA102 (JA804A) have done some customer flights out of Everett but probably need to do a few more flights before ANA formally accepts them. I do think that Boeing can deliver all three airplanes within the next week in order for ANA to meet its newly revised international 787 service schedule. It is to start Tokyo - Beijing service in the middle of January and Tokyo - Frankfurt service in February. As far as other airplanes, ZA236 has yet to make a flight to start finish F&R/ETOPs testing on the GEnx powered 787. There is no word on when that will happen though it has run its engines for the first time just before Christmas though there was a small fuel fire 30 minutes into the engine run. I don't know what effect that has on the schedule as of now. Possible Delivery Delay for GEnx powered 787? Given that the delays to the 787 for ANA are well documented, Boeing is pushing hard to get three more Dreamliners into the hands of the airline before the end of the year. The revised delivery schedule for this month shows that ZA116 should deliver around Dec. 27 with ZA104 and ZA102 delivering on Dec. 30th. Of course this is all subject to change. The knock on effects maybe felt to the GEnx powered 787s. Let's review first. Boeing has flown almost all the test points for FAA certification of the GEnx-1B powered version of the 787. The remaining test points that need to be completed is functionality and reliability testing and ETOPs testing. Now Boeing completed some of this testing on the flight test version of the aircraft but the FAA requires that some portion of this testing to be done on a production version of the plane. Boeing has assigned ZA236 (L/N 35, VT-ANH). When Boeing ran the F&R/ETOPs testing on the Trent-1000 version of the airplane it was done on ZA102 (which is being prepared for delivery) and lasted about 300 hours. I am assuming that Boeing will have to fly a similar number of hours for the GE powered machine but some of those hours have been done on the test flight birds (ZA005 and ZA006). It is unknown how many more hours will be needed to finish certification testing. ZA236 has yet to fly and it seems that resources have been diverted from preparing this airplane for flight to preparing the three aforementioned ANA 787s for delivery. Flightblogger had reported that Boeing was to fly ZA236 by the middle of this month but it's now looking that it will be later this month. For the Trent-1000 version, Boeing conducted the 300 hour F&R/ETOPs over a 51 day period during this past summer. Assuming that Boeing has to only fly half that amount (150 hours) with ZA236 (with the rest already done by the test aircraft) which means about 3 to 4 weeks of flight tests and that testing starts soon after the New Year, the test program can wrap up around the end of January. Figure a couple of weeks before the FAA issues the amended type certificate (middle of February) then deliveries can take place start in middle to late February. This is assuming that there aren't any production issues holding up these airplanes and no unexpected issues that are revealed during the final F&R/ETOPs testing. Boeing's delivery forecast for the GEnx-1B was very early 2012 (January) and internal documents up until last week had Boeing delivering the first to Japan Airlines in January 2012. This is now not the case as the situation is still very fluid. Boeing announced today that the first 787 to be built in their new plant in North Charleston has touched down on its wheels for the first time today. The weight on wheels means that this airplane will be rolled to the last final assembly spots for further assembly tasks. The airplane is destined for Air India and is designated ZA237, L/N 46. Boeing is expecting that this airplane should be delivered by mid -2012 but Jim Albaugh has indicated that it can be delivered earlier than that. It appears that this aircraft (from the photo above) is headed for the third position on the line where, according the the Boeing press release, it will receive mechanical, electrical and hydraulic systems and under go testing. Presumably it will head to position 4 for interiors and engine installation. first time on Dec. 18. "This is a great testament to what can be done when a well-trained, knowledgeable and highly motivated team focuses on a common goal." Made from composite materials, the Boeing 787 Dreamliner is the first mid-size airplane capable of flying long-range routes and will allow airlines to open new, non-stop routes preferred by the traveling public. As a result of innovative technologies, the airplane offers unparalleled operating economics, fuel efficiency and passenger comfort. More than 800 787s are on order by more than 50 airlines, a testament to the airplane's unique capabilities. In the background of the photograph is the next Dreamliner to be built at Charleston already in the wing-body join tooling in position 1. This airplane is ZA238, L/N 54 and is also destined for Air India. In other news not too much is happening with the 787s at Everett though there seems to have been a lot of movement of the completed airframes from pictures on Matt Cawby's web site. ZA 104 made its first flight yesterday and Boeing, so far, is maintaining a delivery target for the end of this month. ZA116 had ANA pilots conducting radio checks today while ZA102 was supposed to conduct taxi tests now that it out of change incorporation. All three of these airplanes are scheduled for delivery late this month with ZA116's delivery coming up first. The next few days will be very interesting. A source told me this morning that L/N 42 (ZA105, JA808A) wil not be delivered this month as originally intended. This aircraft is still sitting in front of the EMC going through final preparation for delivery but Boeing will probably have to wait until next month. This is hardly a surprise given all the work yet to be done to get these airplanes ready for delivery. Boeing will try to deliver 3 more 787s this year for a total of 5. Boeing has already delivered 9 747-8F airplanes and will probably be done for the year for 747 deliveries. The total 747 and 787 deliveries will total 14 of which 1/3 are 787s and 2/3 747 which is what Boeing had projected earlier this quarter. However, they were hoping to deliver 15 - 20 787s nad 747s in total. Unfortunately they will not even reach the lower bound of that number. There has been no further test flights of any production 787s as of yet. In the wake of the news coming out of Japan of the delay to the 3rd Dreamliner delivery more news has since come out courtesy of Dominic Gates at the Seattle Times and Susanna Ray at Bloomberg News. Dominic Gates reported yesterday evening that the reason of the delay for the third 787 to ANA is wiring issues that the FAA found during a standard inspection as well as non functioning APUs in three 787s. Because the APU didn't start, tests that were to be done with the APU running had to be put off until the units were replaced. Boeing is calling these issues minor yet they were severe enough to force ANA to revise its international plans that were supposed to start this month. It is unknown if this is a problem that is endemic through the 787s that are sitting in Everett or it is just a one off problem. Still the upshot is that the L/N will not be delivered until middle of next week and the other three airplanes that are set to be delivered have yet to fly on their pre-delivery tests with Boeing and ANA pilots. The delay which this site reported back in mid November forced ANA to postpone the start of international 787 service to next month. Due to the pressure to deliver these four airplanes (L/N 9, L/N 31, L/N 41, L/N 42) Boeing is having some of it workers work through the holiday season which is traditionally a week off for Boeing employees. Undoubtedly they will probably be well compensated for their time. There are only three of these airplanes on the Boeing flightline though the fourth, L/N 42, is outside in front of EMC so it might be pulled out to the flightline very soon. Interestingly according to the Bloomberg article, the APU and wire issues aren't pacing the schedule. The question then is, what is pacing the delivery schedule, at least in the near term. Both articles say that Boeing feels that the issues are minor. As of yet L/N 41 and L/N 42 have not flown and L/N 9 while it has flown still has not begun the process of Boeing and customer check flights. L/N 31 has had quite a few flights but has not flown since Wednesday, Dec. 14th. I'll be watching to see if there is any further movement on these airplanes but certainly, if the other three airplanes have not flown by middle of next week then Boeing's hopes of delivering at least four 787 this month will be dashed. Lastly, in a related note, L/N 35 which to perform the ETOPs/F&R testing for the GEnx-1B on a 787 production frame still has not made its first flight. IF Boeing hopes to deliver the GEnx powered 787 next month they need to start flight tests on this airplane very soon or the certification and start of deliveries can slide to the right again. According to a source, Boeing will now attempt to deliver 4 787 in the month of December instead of 2 as I had previously reported. In addition to JA805A (L/N31,ZA116) and JA807A (L/N41, ZA104); Boeing will also try to deliver JA804A (L/N9, ZA102) and JA808A (L/N42, ZA 105). L/N 9 has already flown as it took part in the certification test program when it conducted F&R/ETOPs testing for the 787/Trent-1000 combination. Boeing should be able to deliver this airplane though it still needs to conduct pre-delivery test flights. Of the four airplanes that are mentioned above, only L/N 31 is flying customer and Boeing pre-delivery flights. It it anticipated that this airplane should be delivered within the next one week, before Christmas time. The other three have yet to fly and are all scheduled to be delivered just before New Year'e Eve (2011 in case you were wondering). L/N 42 was to have flown on Dec. 13th and it is still not on the flightline as of yet. L/N 41 is supposed to fly on the 16th of December. Additionally, it was revealed that Boeing has penciled in three 787 deliveries for next month. L/N 23 (JA822J, ZA177) will be the first 787 with GEnx-1B engines delivered to a customer. This airplane has just returned from San Antonio where it was undergoing change incorporation. It has received a new paint job (which has underwhelmed the aviation geek community) though I don't know if it has its customer interiors fitted as of yet. L/N 35 (VT-ANH, ZA236) for Air India is also due to be delivered in January. This airplane is supposed to start ETOPs/F&R testing in support of the certification test program for the GEnx powered 787s. According to Flightblogger, this airplane is to have it's first flight around the middle of December so far nothing yet. Lastly, L/N 40 (JA806A, ZA117) will also be delivered to ANA in January. This aircraft is still at EMC. Nothing is certain with these three airplanes and their delivery dates are dependent on getting the work done on them as well as finishing up ETOPS and F&R testing on the GEnx powerplant. This is quite an ambitious schedule for the next two weeks for Boeing. They are still struggling with the amount of work that has to be done on the 24 or so 787s that are in Everett. Particularly vexing is the amount of work on the early build 787s. As I had mentioned before none these early build 787s are in EMC (yet) or in 40-24. They're all stacked up on the Everett flightline. Most of the deliveries are the late build models which don't require as much work. Even so, the amount of work is so daunting that Boeing is trying hard to get the late build 787s into the air and into the hands of customers. There is a rumor going around that Boeing is pulling people off the 747-8 airplanes that have to be prepared for delivery and putting them on 787. If so then 747 deliveries might fall as a consequence. Boeing has delivered 8 thus far and are planning to deliver 1-2 more 747s. Time is running out if Boeing is to deliver even two 787s this month let alone 4. Boeing conducted the first flight of the next 787 to be delivered on Dec. 5, 2011. BOE116 took off this afternoon from Everett heading to Moses Lake Airport and then back to Everett. The aircraft should be in the air for about 3 hours. Production aircraft usually have about 20 - 25 test hours flown by both Boeig and customer pilots befoer they are delivered. I expect that this airplane (L/N 31, ZA116, JA805A) should be delivered in about 2 to 3 weeks. With all the excitement over yesterday's Boeing-IAM contract extension, there wa also news about the 787 that has come out and I would like to recap here. Boeing is still about 95% complete with 787-GEnx-1B certification testing according to Jim Albaugh who spoke at a Credit Suisse conference in NY yesterday. Certification testing using ZA005 and ZA006 are more or less complete according to Flightblogger, in a post on Nov. 29th. Additionally, he reported that ZA006 is getting some test equipement removed pior to be sent to San Antonio for refurbishment into a customer aircraft. If the change incorporation being done on production aircraft is any indication then this work on ZA006 is likely to take quite a bit of time to complete. Boeing has done some of the F&R testing on the test aircraft but has to do the rest on a production standard aircraft. The 787 that has been tasked for this work is L/N 35 which is a 787 to be delivered to Air India. According to Flightblogger, first flight of this airplane has been delayed to around the middle of December owing to the slower pace of change incorporation on the 787s. Because of the delay in getting the needed aircraft, delivery of the first GEnx-1B 787 has slipped to January of 2012. The first one will be delivered to Japan Airlines, probably L/N 23, ZA177 which just returned form San Antonio after undergoing change incorporation work. Just yesterday the GEnx-1B engines received it ETOPS 330 certification however both the Trent and GEnx engines in combination with the 787 airframe won't be certified for ETOPS 330 until a fix to the fuel monitoring software is implemented, tested and certified by the FAA. According to Guy Norris, Boeing has completed certification testing for the Trent 1000 package "B" improvements for the 787. This will allow Boeing to finally start to deliver 787 with the new Trents which bring the specific fuel consumption to within 1% of the original promised specs. Boeing had undertaken this testing using ZA004. Over the last few weeks this airplane has been flown several times a day in order to finish up all the requirements. Once the FAA has received and approved all the test data, Boeing should be able to start delivering 787s with this engine. L/N 31 will be the first 787 to be delivered with the package "B" Trent 1000 engines. The pace of deliveries is obviously being didtaced by the pace of change incorporation which is excrutiatingly slow right now. The pace has already pushed the GEnx 787 deliveries out to January as well as deliveries to Trent 1000 customers further to the right. ANA was supposed to have received 5 787 in December...it will only receive two (L/N 31 and L/N 41). Both these airplanes are Trent 1000 package "B" airplanes. There are two other ANA 787s that have their engines attached and being prepped for delivery. These are L/N 9 (ZA102, JA804A) which was just pulled out to the Everett fuel dock and L/N 42 (ZA105, JA808A) which is still in front of the EMC. These airplanes are not due to be delivered until after January 1st but there are now more 787s appearing on the flightline in preparation for delivery which is a good sign but on the flip side most of the aircraft that are out on the flightline are very early build airplanes that need extensive re-work done before they can be delivered to customer. Just to get these 11 airplanes (L/N 7 to L/N 19) done would probably take a good 2 years. Most of the deliveries will come from the late builds, particularly L/N 30 on up. Jim Albaugh gave a nice update on the status of 787 production and ramp up. Currently they are are still at producing at 2.5 787 per month with the aim of ramping to 3.5 by around March or April and then to 5 by the end of 2012. Boeing is still maintaining it guidance of 10 787s per month by the end of 2013. Albaugh had very good things to report about the North Charleston plant. The first aircraft from that line should deliver before June of 2012. The plant is capable of producing 2.5 787 per month right now. Boeing has now opened up the delivery center as well as the 787 interiors fabrication plant to supply bins, partitions, crew rest areas, etc. for the Charleston built 787s. Now that test flights are nearing the end (at least for the 787-8), Boeing is starting to make plans for the first three airplanes built. ZA004-ZA006 will be refurbished and sold to customers (BBJ). Boeing has flown ZA001, the first 787, to Palmdale Airport where it will be in storage until they figure out which museum to house it in. Likely candidates are the Museum of Flight in Seattle or the Future of Flight museum in Everett though I wouldn't count out the NASM (National Air and Space Museum) in Virginia out. ZA002 is going to be in Charleston, SC for some time for testing purposes but its long term fate is unclear. ZA003 is due to start a 6 month tour of the 787 on December 5th. First stop is China an other Asian and African countries whose airlines have bought the 787. After the tour is completed the aircraft's long term fate is also undecided. No doubt there would be some testing to be done, particularly on engine and airframe improvements to lower weight and increase fuel efficiency and reduce the noise footprint. This is why ZA002 and ZA003 will probably held by Boeing for the foreseeable future to serve as test beds for these improvements. Today is a day for big news out of Washington State. Boeing and IAM 751 which represents Boeing line workers in Washington State have come to an agreement after about 6 weeks of secret negotiations according to the Seattle Times. This agreement will supercede the current contract which expires 10 months from now. The main provisions of the deal will require Boeing to locate 737 MAX production at Renton (this is logical given current 737 production is there). Boeing used the 737 MAX line as a bargaining chip to win settlement of another Boeing problem...the NLRB suit against Boeing which located the second 787 line in Charleston, SC. The details of this settlement of the NLRB suit are not yet known but I am assuming that it means that the NLRB will not pursue the suit against Boeing and Boeing will not have to shut down the Charleston plant. Other main points in the 4 year deal is 2% annual raise plus COLA, a ratification bonus of $5000/employee as well as a 2% - 4% pay bonus. All this is pending IAM 751 membership approval. A vote is to take next week. Dominic Gates said that there will not be an y immediate announcement of the NLRB suit due to it needing to be signed off by the NLRB and Obama. Given the current political environment and how the Republican party has raised its voice over this issue it is a no brainer for Obama and the NLRB. This is a win on many fronts. It a win for Boeing because it ensures labor peace for four more years and the NLRB is off its back. Presumably the 787s will still be assembled in both Everett and Charleston but the details are unknown at this time. It's a win for the union as it ensure that 737 production will stay in Renton and that members are getting the pay they expect as well as other benefits. It's a win for the NLRB and the Obama administration, even though they had nothing to due with the negotiations (as far as I know) as the NLRB suit became a huge issue for them in a year before the presidential elections are to take place. It will be interesting to know the details of the settlement of the NLRB suit though. It's a win for both the cities of Charleston and Renton as it will mean that there will be no layoffs at those plants due to non-economic factors. SEATTLE, Nov. 30, 2011 /PRNewswire/ -- Boeing (NYSE: BA) today announced that it intends to build the new 737 MAX in Renton, Wash., pending approval of an early contract extension with the International Association of Machinists & Aerospace Workers (IAM), the union representing hourly employees in Washington, Oregon and Kansas. As part of an effort to improve their relationship, Boeing and the IAM have been discussing the potential for an early contract extension for several weeks. 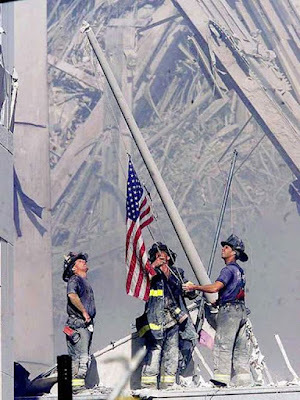 The current contract is set to expire in September 2012. Independent of that effort, Boeing has been conducting a review of potential sites for 737 MAX production since the company announced in August that it will build a new-engine variant of the market-leading 737. Boeing has assessed the business case for locating production of the 737 MAX in Renton in light of the economics of a proposed new labor agreement, and the company is prepared to locate 737 MAX production in Renton provided the economics contained in that proposal are achieved. Upon ratification of such an agreement by hourly employees, Boeing says it will make the necessary investment to produce Next-Generation 737s and 737 MAXs in its existing Renton facility. "The 737 MAX builds upon the legacy of the world's best single-aisle airplane and continues to generate overwhelming response from our customers," said Jim Albaugh, president and chief executive officer, Boeing Commercial Airplanes. "If our employees ratify a new agreement, building the 737 MAX in Renton will secure a long and prosperous future there, as well as at other sites in the Puget Sound area and in Portland, Ore., where 737 parts are built." To date, Boeing has received more than 700 commitments from our customers for the 737 MAX. The new airplane is expected to enter service in 2017. Another important take away is that this agreement may start the healing process in the relationship between the IAM and Boeing. Time will only tell on that account. Matt Cawby posted a photo of the 4th 787 to be delivered to ANA outside at the Everett Field fuel dock. This aircraft L/N 41 is registered as JA807A and is expected to be delivered around mid to late December. The aircraft is shown with it Trent 1000 engines and the protective covering removed from the windows of the aircraft. As I blogged a couple of days ago, this aircraft along with L/N 31 will be the only 787s delivered in December. Boeing will have delivered only 4 787s in 2011 with expectations that they would have delivered 6 - 8 787s. Again most of the very early build aircraft are still outside on the Everett flightline and not inside where the change incorporation rework is being done. In other news ZA004 has been taking to the air of late and I can only surmise that this is related to getting final FAA type certification for the Trent 1000 package "B" improvements. Boeing will need this certification before delivering any 787s withe these improvements and I suspect that L/N 31 and L/N 41 are equipped with the package "B" Trents. Did AMR order more 777-300ERs? Today AMR detailed the breakdown of their huge A320 order (they're converting the order of 130 current generation A320s into a mix of current gen A319 and A321). However what is interesting comes at the end of press release. In the last paragraph, AMR states that they have orders for 15 777s that are to be delivered between 2012 and 2016. Looking at Boeing's O&D web site shows that AMR has orders for 7 777-300ER as well and 6 777-200ERs (left over from the order placed in the 1990s). I don't think that these 6 777-200ERs will ever be delivered to AMR. Interestingly enough Boeing booked an unidentified order last week for 8 777s the version is unknown until Boeing releases it's orders for the month in early December. However there is some confusion if this 777 order is for American Airlines or Singapore Airplanes which had announced an order for 8 777-300ERs. Boeing did book another order for 8 777-300ERs also in September, 2011 so it is possible one of these orders is for Singapore Airlines and the other is for American. According to sources, Boeing will deliver only two more 787s the rest of this year. The two aircraft are both destined for ANA and are late build 787s. L/N 31 is already out on the Everett flightline has had some ground test done but has yet to run its engines for the first time. Boeing plans to fly this airplane on its B-1 check flight sometime next week and deliver around the 2nd week of December. The next airplane will be L/N 41 which is currently located in the Everett Modification Center. This is another late build airplane which should fly around early December and be delivered around the 3rd week of December. So far Boeing is not planning any deliveries of the GEnx-1B powered 787 next month. In their last earning release, Boeing said that they expect the number of 787 and 747s to be delivered in 2011 to be between 15 and 20 units with 747s accounting for 2/3 of that. If using the low range of that forecast then Boeing was giving delivery guidance at 5 787s and 10 747s for this year. Their well on their way to 10 747s and perhaps more but they will fall short on 787s deliveries for 2011 that they had given guidance on. Unfortunately, the view of the Everett ramp seems to confirm this situation. ANA said in late September that they were expecting to take delivery of 5 more 787 by year end and have a total fleet of 7 by Dec. 31st. Currently there is only one airplane with Trent 1000 engines hanging from the wings (L/N 31) with two 787s with GE engines on the ramp. The GEnx-1B certification program is not complete yet so it is doubtful that those planes won't be delivered until sometime in the New Year. Boeing was expecting to deliver 6 by the end of 2011 but it's looking increasingly like it won't even make that number. So what is the problem? Two things: 1) Too many jobs that need to be fixed, particularly on the early build 787s (L/N 7 to L/N 19). 2) Lack of adequate resources to finish the job in a timely manner. Boeing may have a plan to deal with the jobs that yet to be done on all these airplanes but it is time consuming and there is a need to try and get the airplanes that have the fewest re-work requirements into the hands of customers. It's no wonder that 3 of the 4 airplanes that would have been delivered are late build 787s. It looks like Boeing will be spending a lot of time getting those 12 other 787s ready for customers and the only way to do that is to assign more resources (i.e. workers) to tackle these airplanes and get them out. On a bit of positive news, some of the suppliers are starting to ramp up production of their work share in order to support Boeing's ramp up of 787 production. Mitsubishi Heavy has added a 2nd autoclave to support increased 787 wing box output. Currently Boeing is at 2.5 airplanes per month and hopes to be at 3.5 by sometime next spring. Also on a brighter note, the backlog of 747 on the Everett ramp also seems to be diminishing as Boeing has delivered 5 of them thus far and has two more in flight tests. It does look like they can deliver 12 to 13 of the 747-8Fs by the end of this year. At least the 747 deliveries frees up more ramp space for the 787s coming out of final assembly. With Dubai 2011 underway, Boeing has drawn first blood with a huge order from Emirates. But first some 787 tidbits. Boeing sent two of it's 787 test planes on international marketing trips. ZA001 is flying to various 787 customer destinations to show the aircraft around the world. First stop is New Zealand where Air New Zealand is to induct the first 787-9 into it's fleet in a little over 2 years from now. It will go on to Australia from there where Jetstar and QANTAS will take delivery starting in 2013. ZA003 is now flying with a full passenger interior with the test workstations and other flight test equipment removed. It also is sporting a new paint job which is a hybrid of the Dreamliner livery that Boeing painted on ZA001. Meanwhile, back in Boeing has pushed another 787 out the door and has reallocated several 787 to other airlines. L/N 50 and L/N 51 are currently on the final assembly floor and each has been reallocated to United and ANA respectively . They were to have gone to Ethiopian and LAN but were changed for unknown reasons. With the start of assembly on L/N 51 Boeing is on it's way of 2.5 787s per month with the target of 3.5 to occur sometime in early 2012. One of the early build 787s appears to have completed the change incorporation and re-work. That airplane is L/N 23 (ZA177) which is destined for Japan Airlines. The aircraft took a check test flight on Nov. 11th and was ferried back to Everett on the 13th. It still does not have a customer interior but that work will be done in Everett along with testing of the interior and then Boeing and customer test flights prior to delivery. Given that work, Boeing can deliver this plane to JAL by the end of December or early January, 2012 depending on the remaining certification activities that need to be completed on the GEnx-1B powered 787. I am still maintaining my short term view that Boeing should be able to deliver 6 more 787 in December (no November deliveries). Most if not all these deliveries will be later production airplanes for ANA with a later production GEnx airplane added in. Speaking of which, ZA006 continues F&R and ETOPS testing. Last word from Boeing was that GEnx-1B testing was 95% complete so I do anticipate that Boeing can complete all certification testing by the end of this month will the aim of having first delivery by the end of December to either JAL or Air India. The Dubai Air Show got of to a bang with a huge order by Emirates for 50 777-300ERs. The bang not only came in the size of the order $18bn at list prices, or the fact that this is Boeing's largest commercial aircraft order by value or that it will make Emirates the largest user of the 777. The big bang came in the message this order sent to Airbus. It has been no secret that the market really hasn't accepted the A350-1000 as a viable competitor to the 777-300ER. The market response after launching the A350 coupled with the feeble attempt by Airbus and Rolls Royce to improve the aircraft earlier this year and the 2 year delay (with possibly more delays to come) has angered customers for the airplane, namely Qatar and Emirates. Thus this order at the start of the airshow was meant as a message to Airbus about the status of the A350-1000. Additionally, the A350-1000 is barely a better airplane than the Boeing offering but with the proposed 777-8X/9X (on which Emirates has been working closely with Boeing) thus this latest order would allow Emirates to easily introduce the next iteration of the 777 as this latest order is delivered towards the end of the decade. I wouldn't be surprised if Emirates has a conversion feature in the contract that allows them to convert to the newer model after Boeing launches the airplane with delivery aimed for 2020. Airbus did get into the order column with an order for 50 A320NEOs from ALAFCO. This same lessor announced today that they sold 6 or their 787 orders to Oman Air. So this order with Oman is really a non-order order. Boeing is still adding more MoUs for the 737 MAX. The count is 700 airplanes spread across 9 customers with only American Airlines the only named customer of those 9. I don't expect any of these MoUs to be firmed before the end of the year but most if not all should be firmed by the end of 1st quarter 2012 in addition to any new customers that would have signed on by then. In order to be producing at a 2.5 aircraft rate, Boeing needs to start final assembly on a new 787 every 12 days (excluding holidays and assuming a 30 day month). It looks like they're trying to get there but I was expecting L/N 51 to start final asembly a couple of days sooner. Now that 787 deliveries have started, many are wondering what 787 deliveries will look like going forward. I've put together a quick spreadsheet in Google Docs to estimate the number of deliveries Boeing can possibly make from now to the end of 2012. I'm taking into account the current inventory of 787s that Boeing has assembled but still has to finish change incorporation, 787s that have yet to finish final assembly and also go through change incorporation, and finally 787s that have yet to be assembled but would not have to go through the change incorporation process. In deriving this delivery curve I've had to make a few assumptions. 1) Assume that airplanes 7 to 60 will undergo some type of change incorporation/re-work. Boeing has said that they expect that all changes that have flowed up the supply chain would have been incorporated by airplane 60. 2) The more recently completed 787s will not have to go through as much change incorporation/re-work compared to the earlier completed aircraft. 3) Boeing cannot put too much resources to completing all the aircraft that need work thus the very long timeline to liquidate the inventory backlog. 4) Production rate is assumed as follows: 2.5/month from November 2011 to June 2012, 3/month from July, 2012 to August, 2012, 3.5/month from September, 2012 to October, 2012, and 4/month from November 2012 to December 2012. 5) All 787 that are assembled starting in March 2012 are assumed to be ready for delivery after painting and pre-acceptance test flights by Boeing and the customer. It is assumed that these newly assembled aircraft would not need any change incorporation or re-work after leaving the factory. Currently Boeing has 35 airplanes which have completed the majority of final assembly and are in various stages of re-work and storage around Everett. There are two more 787s in San Antonio that are undergoing change incorporation and four more airplanes that are being assembled. This is a total of 41 airplanes in Everett. I expect no 787 deliveries in November (though that could change) but 6 deliveries in December including 5 to ANA which I expect to be a mix of early and late build aircraft as well as the first GEnx powered 787. After that the deliveries would start out in 2012 at 3/month slowly rising to 8 per month in April and staying steady for about 5 months. This is basically the time that Boeing is flushing the inventory pipeline but also delivering newly built 787s fresh out of the final assembly hall. This number starts to decrease and taper off to a point that all aircraft that are delivered are ones that are coming off the assembly line. Given that I expect Boeing to go through the inventory within one year (52 airplanes), I projecting that Boeing can deliver 83 787s between now and Dec. 31st, 2012. Undoubtedly, Boeing has probably done a more detailed analysis than I have but this is something which I hope can provoke a discussion. The 787 Dreamliner officially entered into airline revenue service with ANA flight 7871 flying from Narita, Tokyo to Hong Kong's Chek Lap Kok International Airport. The start of revenue service allows the opportunity to hear about the passenger experience from those not connected to the airline or to the manufacturer. Initial passenger reaction has been very positive especially with the dimmable windows as well as the noise level of the aircraft. One of Boeing's aims was to greatly improve the passenger experience while on board the airplane and it seems that they have accomplished just that. Overall this is a very promising start the the 787s service life though it's only one flight. Boeing has prepared for this day over the course of 7 years and with the delays have aimed to mature many of the systems that are on the 787.
the last month has been a mixed bag for Boeing in terms of orders and deliveries for Boeing. They did deliver the first two 787s to ANA and has supported the airline's efforts to put the airplane into service but the news from the order's front does dampen some of the enthusiasm stemming from the start of deliveries. China Eastern Airlines has cancelled their order for 24 787s and has decided to take 45 737s. Boeing has since said that they expect more cancellations though they would give a number. One of those might be a partial cancellation by Air India. The financially troubled airline which is run by government bureaucrats instead of airline executives, has concluded that they ordered too many aircraft when they placed a huge widebody order with Boeing in 2005. They want to cut the 787 order by more than half to 12 airplanes from the original 27 that they have on order. Presumably Boeing and Air India have entered into discussions about the 787 order but currently Boeing has several 787 already built and undergoing change incorporation. Two of them also have engines hung. ANA did announce that they expect to have 7 Dreamliner's delivered to them by the end of the year (thanks to Flightblogger for Tweeting that particular bit of news). This bit of news is very interesting given Boeing's announcement this morning that they will deliver 15-20 787s and 747-8 this year. The reason for the reduction in estimated deliveries is due to the amount of time needed for change incorporation. During the earnings conference call, Boeing estimated that about 2/3 of this range will be 747-8 deliveries and the rest 787-8. This two pieces of information indicates that Boeing will probably deliver 5-8 787 (with 8 being the more likely number) and 10-12 747-8. Of the 8 787s delivered, I believe there will be 7 going to ANA and one GEnx aircraft possibly to Air India. Given the dynamics of the Air India situation and the pace of re-work on the $18bn of 787 inventory sitting at Everett, the number delivered will be very fluid. I have received information that as of now Boeing is not planning any 787 deliveries for November though that may change. A reasonable measure of how close a 787 is to being delivered is when the aircraft has been fitted with its engines. Currently only a handful of 787s have their engines attached including two that were flown to Boeing's facility at Lackland Air Force Base in San Antonio, Texas. There are probably three other airplanes that I know of that have engines attached (LN 31, LN 35 and possibly LN 38). There are 5 other airplanes including 3 for ANA that are in the Everett Modification Center (EMC or otherwise known as ATS) that are undergoing re-work and could quite possibly have their engines on. These are later build airplanes (LN 40, LN 41, and LN 42) which don't require much re-work to be ready for service. It is quite possible that these airplanes would be ready for delivery in late November to December. Other airplanes that would be ready for delivery include LN 7 and LN 9 which was used for Boeing's ETOPs and F&R testing. Speaking of re-work, Boeing is reporting improved build of parts that are flowing into Everett and they are projecting that the production system will reach a point where most if not all change incorporation will not be needed by airplane 60. First the testing update. Boeing reported that the testing program on the GEnx-1B powered 787 is well into the F&R/ETOPs phase and overall they are 95% complete with testing of this model. ZA006 is the only aircraft that is dedicated to F&R/ETOPS testing as Boeing is not using a production standard aircraft for this testing (they probably convinced the FAA that it is not necessary to use a production standard aircraft for some reason). Additionally, ZA004 which has been conducting flight tests with the Trent 1000 package "B" engines has probably wrapped up most of the flight testing (it has not flown since Oct. 19) though I don't know if they have to do ETOPS/F&R testing using the modified engines or not. Boeing is planning to deliver the first 787 equipped with the package "B" Trent 1000 sometime in December as it will be these 787s that ANA will start using on long haul international flights. Now on to production. Now that Boeing has most of the 787-8 flight testing and development out of the way, they can proceed with focusing on reducing inventory ($18bn now) and ramping up assembly. Certainly having the North Charleston line open will help but right now many of the techs there are building LN 46 very slowly as they are in the process of learning their job. However, Boeing needs to clear the 40 some odd 787s that are listed as work in process (WIP). 38-39 are at Everett while two more are at San Antonio. Change incorporation is going slowly especially with the early build aircraft that I anticipate that most of the WIP aircraft won't be cleared until late next year. However Boeing did announce that they will be increasing the 787 production rate to 2.5/month starting this week (I'm projecting this Sunday) starting with LN 50 which is for Ethiopian Airlines. It seems that Boeing is planning for another rate increase very soon after going to 2.5 as they are reporting that the supplier base is positioned for further rate hikes very soon though timing and rate of these increases is still a matter of speculation. I'm thinking that Boeing can increase the rate to 3 or 3.5 by February. Boeing is still reiterating their position that they will be able to produce 10 787/month by the end of 2013. After that rate has stabilized over a course of 1 to 2 years Boeing sees that 787 unit revenue will exceed unit cost by around 2014-2015. The program won't be profitable after about 10 years of production. They have now set their accounting block for the 787 program at 1,100 units (they are spreading all development costs across 1,100 airplanes). Of course this is all predicated on Boeing reaching the 10/month goal by the end of 2013. I’m happy to announce that we’ve resolved the contractual issues that delayed the first delivery of our new 747-8 Freighter last month. 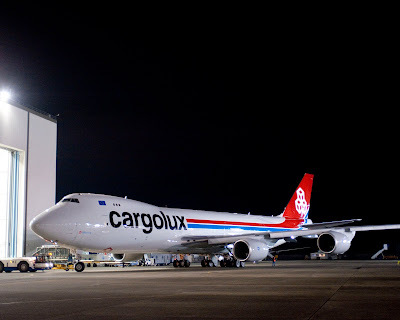 I’m even happier to let you know that Cargolux will take delivery of their first freighter today (October 12) and immediately put it into service with a stop at Sea-Tac Airport for a cargo pickup. On Thursday, Cargolux will take delivery of its second 747-8F. Even though we had to wait a bit longer than expected, it doesn’t make these deliveries any less sweet. We know Cargolux and every customer after them will love this airplane in every way—from how it flies to how it performs. I’d like to personally congratulate every employee who had a hand in working on this beautiful new symbol of Boeing. We all look forward to seeing it take to the sky as an official member of the Cargolux fleet. GE and Cargolux related to the performance of the aircraft and the engines. ensure that the 747-8 entry into service issues be resolved successfully. Freighter will be a driver of profitable growth for Cargolux’. 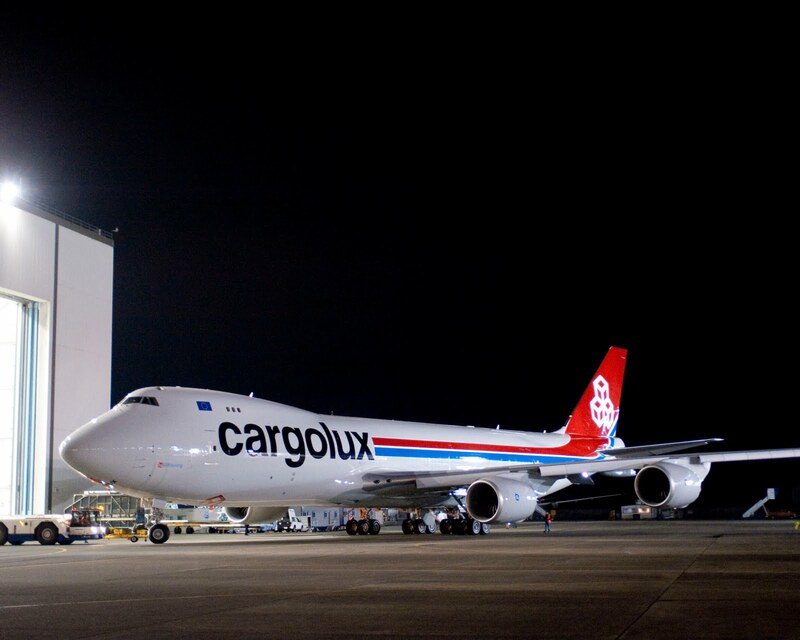 Launch customer Cargolux has 13 Boeing 747-8 Freighter airplanes on firm order. Nowhere in either statement does either company congratulate the other. Randy thanks the employees of Boeing who designed and built the aircraft whereas the Cargolux statement thanks the CEO Frnak Reimen, CFO David Arendt and first and never least, Akbar Al-Baker (U-Turn Al) for leading the negotiations. Funny enough that Cargloux does acknowledge the better fuel burn over the 747-400. The last telling clue about the now strained relationship is that there was no ceremony celebrating the first delivery of this airplane like there was for the 787 and that there appears to be a "stealth delivery" with no mention from either side that it was taking place until after the Flightaware notifications went out. I do think Boeing will eventually hold an appropriate ceremony when the next customer 747-8F is delivered (which I believe to be Cathay Pacific Cargo) if anything to put this awful experience behind them. At least U-Tuen Al won't be there to spoil the celebrations. UPDATE: Boeing just confirmed (through Randy Tiseth's "Randy's Journal" not a press release) that Cargolux is taking delivery of it's first 747-8F and it will fly ti Sea-Tac to pick up its first load of cargo and will conduct its first revenue flight. Boeing will deliver the 2nd airplane to Cargolux tomorrow. Seattle-Tacoma Intl (KSEA) for an estimated arrival at 11:16 PDT. apps for Android, iPhone, iPad, BlackBerry, and WP7! Cargolux's plan after taking delivery of the first 747-8F was to fly it to Seattle-Tacoma International Airport where it would pick up its first revenue cargo load and immediately begin revenue service. This aircraft's flight plan is to fly from Paine Field to Sea-Tac. Boeing, GE, Cargolux and Qatar Airways are close to hashing out a final agreement and Qatar Airways chief Akbar Al-Baker (U-Turn Al) has said that Oct. 12th was a target date to accept delivery. Today Boeing and ANA completed the contractual delivery of the first 787 which meant that the formal delivery acceptance documents were signed and ANA paid the final installment for ZA101 (LN8). There will be a ceremonial handover on Monday in an elaborate ceremony...no word on if there's a special musical guest for this one but the paperwork was signed today and the aircraft now officially belongs to ANA who will fly it to Haneda on Tuesday. Boeing has also flown ZA103 (LN24), the next 787 to be delivered to ANA, on Sept. 24. It is scheduled for its delivery around mid October. Currently, delivery of the 747-8F to Cargolux is still on hold though the two Cargolux airplanes have been making test flights in recent days. Despite the cancellation of Atlas Air's three early 747-8F, Cathay Pacific Cargo said that they are satisfied with the 747-8F and intend to go ahead with deliveries starting later this fall. CNBC is also having a special on the 787 called “Dreamliner: Inside the World’s Most Anticipated Airplane” premiering on Tuesday, September 27th at 9PM ET/PT. that provide exceptional value to airlines and unparalleled levels of comfort to passengers. It is the first mid-size airplane capable of flying long-range routes, enabling airlines to open new, non-stop routes preferred by the traveling public. Testing is continuing on the Trent-100 package b upgrades which will actually be introduced on the next 787 to enter service, LN 24 (ZA103). This aircraft has flown with the package "A" Trent-1000 engines but will be delivered with the package "B" engines next month. Well not too much to report though RC502, the first 747-8F that was to have been delivered to Cargolux did have a customer flight today. This is curious since Cargolux pulled their people out of Everett when the dispute erupted on Friday. They may be back and flying so it MAY be a sign that negotiations are progressing. In a posting by Scott Hamilton this morning, Qatar Airways and it's chief executive Akbar Al-Baker, who have a 35% stake in Cargolux, are allegedly forcing Boeing back to negotiating compensation not just over 747-8F performance shortfalls but also for more compensation for Qatar Airways 787 delivery delays. The later issue was resolved earlier with Al-Baker proclaiming that he was satisfied with the results of the negotiations at the time. Apparently he has has a change of heart with regards to the compensation thus keeping true to his U-Turn Al nickname in the industry. Now mind you that the customers of the 747-8F knew for over year of the shortfalls in performance of the 747-8F and have already or in the process of negotiating compensation because of the issues that were uncovered during flight testing. Additionally Boeing and engine maker GE are in process of developing performance improvement packages (PIP) for the aircraft's GEnx-2B engines that would be backfitted into the earlier models of the aircraft and would allow them to be flown to the initial contracted performance specs (or very close to those specs). If Al-Baker is indeed using Cargolux's 747-8F as a ploy to get more compensation from Boeing, he is playing a very dangerous game. 1) He is putting his investment in Cargolux at risk as they do need these aircraft to remain competitive especially when Cargolux's competitors will take delivery. 2) Boeing can say enough is enough and play hardball. Airbus does not have an alternative to the 747-8F and that would anger Cargolux's other shareholders (Al-Baker only owns 35% of the company) as one company is being used to benefit another company. How this plays out will provide interesting aviation theater which Al-Baker loves. In the meanwhile the 787 looks like will be delivered first and I also don't preclude the ability of Boeing to deliver the 747-8F to other customers who have a firm contract in place with compensation. Cargolux Airlines informed Boeing that they do not intend to take delivery of the first 747-8F on Monday, September 19th. The reason are unresolved contractual issues for the aircraft. While this may be a temporary bump to eventual delivery to the aircraft the concern is what effect wold this have on other 747-8F customers? They may hold out on delivery as well in return to renegotiate their contracts prior to the delivery of their airplanes. This may turn into a serious situation nd the 787 may end being delivered before the 747. Cargolux (and Boeing) has also been touting the impending delivery of the 748F on their web site so it could be some language in the paperwork that needs to be straighten out. So let's see how this contract issue plays out. Cargolux has paid up much upfront costs for these airplanes and they want them right way so they're not going to just walk away. Boeing will receive the amended type certificate for the Rolls Royce powered 787-8 today which will set off a countdown to the type's first delivery and first revenue flight. There will be a ceremony at Everett marking the occasion with ZA001 to serve as a backdrop to the ceremony (it's currently at the Boeing Delivery Center in Everett) where Randy Babbit, the FAA Administrator will speak along with other guests and ZA002 is looking to do a fly past during the ceremony coming from Boeing Field. Both the FAA and EASA will hand over the certification documents to Boeing today as well as the amended production certificate (APC) from the FAA for the 787 production. Boeing is continuing flight tests on the GEnx-1B powered version of the 787. They should be starting F&R/ETOPS testing soon though date still has not been made public. 60% of Boeing's 787 order book will be equipped with the GEnx engine thus type certification of this engine/airframe combination is crucial. Boeing and ANA have said that first delivery ceremony will occur on September 26th (31 days from now) but the contratual delivery will occur on September 25th (this is where all the paperwork is signed and ANA pays for it's airplane) with the aircraft being ferried to Haneda Int'l Airport on September 27th from Everett. 30 days after ANA formally accepts the first 787 the airline will run it's first revenue flight from Haneda to Hong Kong (a charter flight). Starting on November 1st the 787 will be put on regular scheduled service between Haneda and Okyama and Hiroshima. ANA also plans to commence international 787 service from Haneda going to Beijing in December, 2011 and Frankfurt in January, 2012. EVERETT, Wash., Aug. 26, 2011 /PRNewswire/ -- Boeing (NYSE: BA) and ANA will celebrate delivery of the first 787 Dreamliner on Sept. 26 in Everett, Wash., after contractual delivery occurs on Sept. 25. Events throughout the day on Sept. 26 will commemorate delivery of this game changing airplane to its launch customer. "The airplane is ready. ANA is ready. And, Boeing is ready," said Jim Albaugh, president and CEO of Boeing Commercial Airplanes. "This airplane begins a new chapter in aviation history." ANA's airplane will arrive in Tokyo on Sept. 28, following a Sept. 27 departure from Everett, Wash., and will be greeted by ANA employees, media and Japanese partners. Details of events in Everett and Tokyo will be provided in the weeks ahead. Many of the events will be webcast live, allowing people around the world to participate in the celebration. Shinichiro Ito, president and CEO of ANA Group, said, "As launch customer, we are delighted to be taking delivery of our first 787 Dreamliner. This aircraft will enable us to offer new standards of service and comfort to our passengers and will play an important role in our international expansion strategy as we seek to become Asia's number one airline." ANA launched the 787 program with a record-setting order of 50 airplanes in April 2004. The airline has played a key role in guiding the design of the Dreamliner. The Boeing 787 Dreamliner is an all-new commercial jetliner that brings new efficiencies to airlines and delivers superior comfort to passengers. The airplane features the industry's largest windows, a lower cabin altitude and cleaner air. These features combine to allow passengers to arrive at their destinations more refreshed. EVERETT, Wash., Aug. 26, 2011 /PRNewswire/ -- Boeing (NYSE: BA) received certification for the all-new 787 Dreamliner from the U.S. Federal Aviation Administration (FAA) and the European Aviation Safety Agency (EASA) during a ceremony at the company's Everett, Wash., facility. 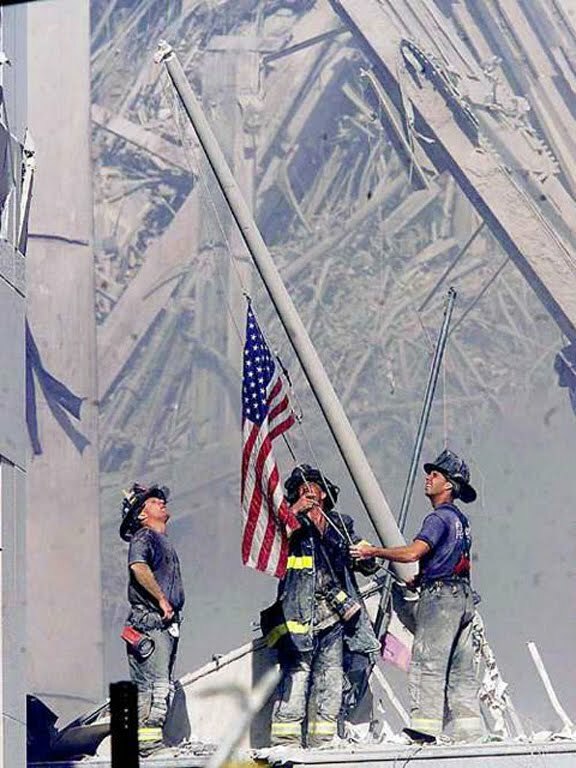 FAA Administrator Randy Babbitt presented the U.S. Type Certificate, which verifies that the 787 has been tested and found to be in compliance with all federal regulations, to 787 Chief Pilot Mike Carriker and 787 Vice President and Chief Project Engineer Mike Sinnett, both of whom have worked on the program since the day it began. Babbitt presented the amended Production Certificate 700 to John Cornish, vice president of 787 Final Assembly & Delivery, and Barb O'Dell, vice president of Quality for the 787 program. The Production Certificate adds the 787 to the list of Boeing Commercial Airplane production systems that have been found to be compliant with all federal regulations. 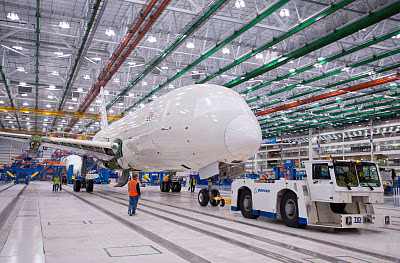 Boeing Commercial Airplanes President and CEO Jim Albaugh said, "Certification is a milestone that validates what we have promised the world since we started talking about this airplane. This airplane embodies the hopes and dreams of everyone fortunate enough to work on it. Their dreams are now coming true." Patrick Goudou, executive director of EASA, presented Dan Mooney, vice president of 787-8 Development, and Terry Beezhold, former leader of the 787 Airplane Level Integration Team, with the European Type Certificate for the 787. Scott Fancher, vice president and general manager of the 787 program for Boeing, wrapped up the event addressing the broad team of those who worked on the program. "This is truly a great airplane. From the advanced materials and innovative technologies to the improved passenger experience and unbeatable economics, the 787 really is a game-changing airplane," Fancher said. Boeing announced today that it has received type certification and the company now has clear path to start delivering the freighter version of the newest member of the 747 family in early September to Cargolux. Cargolux will receive the first 747-8F early next month. The next four months will see Boeing delivering 3 new airplanes to customers (787-8, 747-8F and 747-8I) which is unprecedented in commercial aviation history. The FAA has given Boeing the Amended Type Certificate as well as the Amended Production Certificate (which allows Boeing to produce the 747-8F using FAA validated methods). EASA has also granted the amended type certificate to the 747-8F. Even though the FAA has certified the 747-8F this is not the end of certification activities for this particular airplane. The 747-8F was certified with the flight management software for the 747-400. 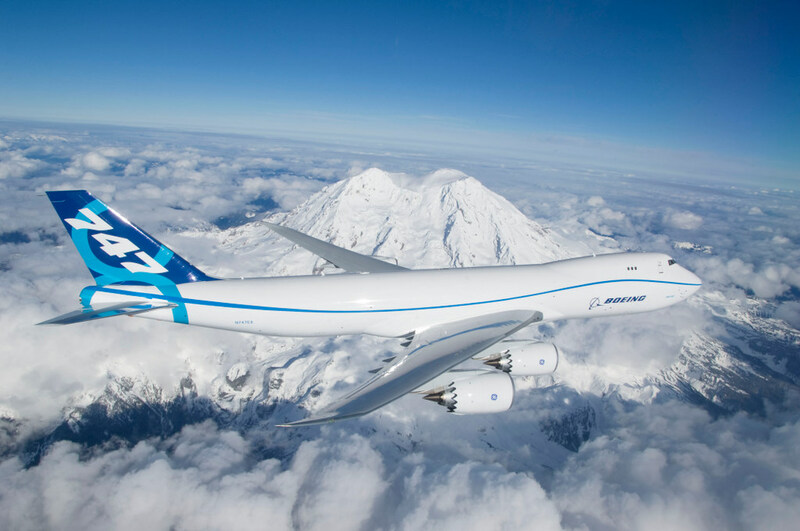 Full certification with the improvements to the software would have delayed the entry into service of the aircraft thus Boeing elected to certify the airplane with the older version of the software and then certify the 747-8 flight management software later this year. The debate over readiness centers on the standard of software in the Honeywell-supplied Next Generation Flight Management System (NGFMS) at the heart of the 747-8 avionics suite. The system enables Required Navigation Performance (RNP) 0.1, and enables operators to comply with both the U.S. NextGen Air Traffic Management (ATM) and the Single European Sky ATM Research (SESAR) program. The system also supports Wide Area Augmentation System Localizer Performance with Vertical guidance, Future Air Navigation System 1 (FANS-1) and FANS-2 requirements. The core of the new FMS also is flying on the Gulfstream G650 ultra-long range business jet, but incorporates an architecture that partitions the flight management code from the user interface. This has enabled 747-8-specific user interfaces, inputs and outputs to be connected to the advanced FMS via a number of “abstraction” layers. The NGFMS software also will run in the same basic FMS box as the current Boeing 747-400, which will be upgraded by inserting a single processor card. There is no word on when flight testing will be complete on the 747-8 flight management software. Boeing is continuing flight testing on the 747-8I and thus far it has flown just under 500 flight test hours of the 600 flight test hours that is needed for certification. Boeing still plans to start deliveries of that aircraft by the end of the year. Meanwhile Boeing is awaiting FAA certification of the Rolls Royce powered 787-8. It is being reported that the certification is expected in another week for the 787-8. Meanwhile ZA101, the first 787 to be delivered started its Trent-1000 engines for the first time yesterday and I anticipate B-1 flight (Boeing first flight) very soon after type certification fy the FAA. Boeing is also planning to start F&R/ETOPs testing on the GEnx powered version of the 787 sometime in September though the date is still unknown. Boeing's 787 backlog is heavily skewed in favor of GEnx powered aircraft thus it is highly important for Boeing to conduct those final tests in order to certify and deliver that version of the plane. The derivative the GEnx-1B that powered the 787, the GEnx-2B will be flying for customers first when the 747-8F enters revenue service. FAA and EASA for all of their hard work. And it's a day to appreciate our customers for their commitment to the program." production system can reliably produce airplanes that will conform to the airplane's design. EASA accepts FAA oversight of Boeing production certificates as sufficient for its regulations, as FAA accepts EASA oversight of European manufacturers' production certificates. pallets. The 747-8 Freighters will be powered with GE's GEnx-2B engines. Today Boeing announced that they have completed type certification for the 787-8. 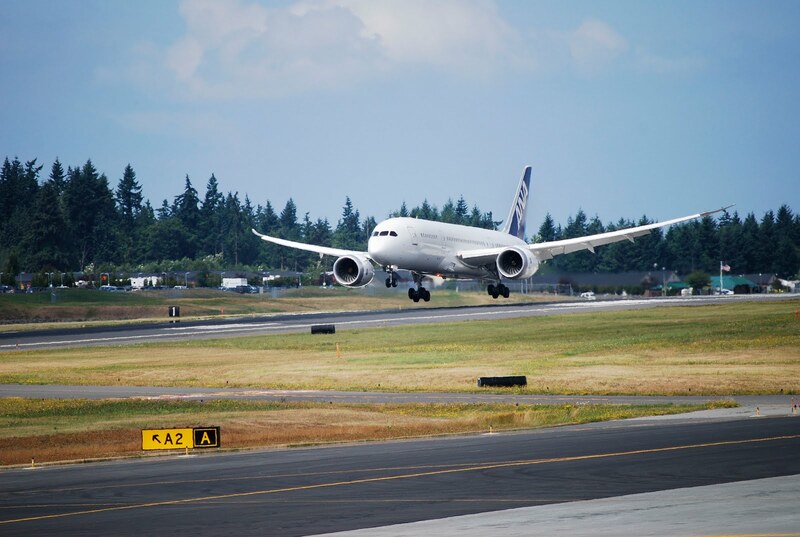 The final F&R test flight was conducted on Saturday and they will now submit all remaining type certification paperwork to the FAA for their review and the issuance of type certification for the Trent powered 787. Boeing says that testing will continue for type certification of the GEnx powered 787 as well as to complete Boeing test points (which are not needed for type certification or delivery). Issuance of the final type certification is now expected by the end of the month with deliveries to start next month. What is still unclear is how many 787s will be delivered to customers this year as the number of 787s needing re-work continues to grow at Everett. The later assembled aircraft do need less rework then the ones produced in the last 2-3 years but the number of jobs still needing to be done is still significant. 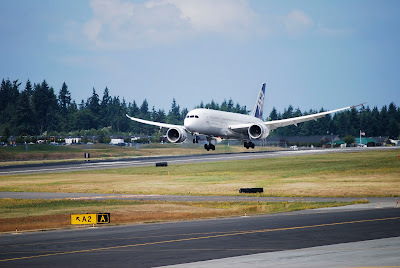 EVERETT, Wash., Aug. 17, 2011 /PRNewswire/ -- Boeing (NYSE: BA) completed all flight tests required for type certification of the 787-8 Dreamliner with Rolls-Royce engines this weekend. The all-new jetliner is bringing unprecedented levels of fuel economy, maintenance cost improvements, and environmental sensitivity to the marketplace through the use of new technologies including composites, more-electric systems, advanced aerodynamics and the latest advancements in propulsion. "We are very pleased with the performance of the airplane during the Function & Reliability and Extended Operations testing over the last month," said Scott Fancher, vice president and general manager of the 787 program. "The Dreamliner continues to demonstrate that we will indeed deliver a truly revolutionary airplane that will be a game changer in the marketplace." The final flight occurred Saturday onboard ZA102, the ninth 787 to be built. Capt. Mike Carriker, chief pilot for the 787 program, brought ZA102 back to its home base at Paine Field in Everett at 1:58 p.m. (Pacific time) following a 90 minute flight that originated in Billings, Mont. During the flight, the 14-person crew completed simulations of a dispatch with a failed generator and failed fuel flow indication. this amazing airplane has been a true inspiration. We look forward to making our first delivery to our good friends at ANA in September." Flight testing continues for 787s with GE engines and for Boeing test points not related to certification. larger windows, cleaner air, higher humidity and a lower cabin altitude. Boeing is expected to complete the system functionality and reliability testing today using ZA102. The aircraft will fly to Salt Lake City International Airport from Paine Field then on to Billings Logan international Airport in Montana and finally back to Paine Field. As of last night the aircraft has accumulated about 280 test flight hours and needs another 7 hours to finish the required FAA certification testing. Today's flights would last about 2hrs, 3hrs and 1.5 hrs respectively getting to the needed 287 hours that will fulfill the FAA mandates. It is expected that Boeing will submit the final paperwork to the FAA around Monday and then to have the final type certification later in the week after the FAA Board meets to discuss the results. First delivery is expected around mid September for the Trent-1000 powered version of the aircraft to ANA followed by the GEnx-1B powered version sometime in the 4th quarter to JAL. Boeing actually has more orders for the GE powered version of the 787 then the Rolls Royce powered version so they would need to make final certification of this version a priority though it is still unknown when they will start F&R/ETOPs testing. Boeing Commercial Airplanes CEO, Jim Albaugh speaking at the Jefferies conference said that the 787 just has 24 hour more flight testing left to be done to complete certification testing for the Trent-1000 powered version of the airplane. Boeing expects to receive type certification for the 787 sometime next week and plans to deliver the first 787, ZA101, to ANA next month. The last bit of F&R testing (which is being undertaken by ZA102) will be completed by this weekend which will allow Boeing to submit the last bit of paperwork to the FAA. The FAA will have a review board meeting with Boeing to go over the the type certification of the 787 which is expected to result in the FAA granting type certification. Yet to be done is the F&R/ETOPs testing for the GEnx powered version of the 787. There is still isn't any clarification as to when that will be started and when Boeing plans to deliver the first GEnx-1B powered 787 to Japan Airlines. Boeing is still talking to the FAA about that testing regime for the GEnx powered 787 and which aircraft(s) will be used to conduct that testing. Albaugh also indicated that the long pole in the tent with increasing the 787 production rate is the North Charleston facilities that Boeing had bought (previously owned by Vought and Global Aeronautica). Those facilities are the "pinch point" according to Albaugh. James Albaugh also said that Boeing is meeting this week with the FAA regarding the type certification of the 747-8F but still plans to deliver the first example to Cargolux next month. Type certification is expected in the next couple of weeks for this airplane.